For lack of material to create an original post this week, here is my translation of an article that was published on Rossiiskaya Gazeta’s website today, which contains excerpts from an interview that First Vice-Prime Minister Dmitry Medvedev did with some German journalists. The original article in Russian can be found here. Dmitri Medvedev gave a long interview to the German magazine Stern, in which he thoroughly discussed many political and economic trends of Russia. The First Vice-Minister immediately rejected the suggestions of many western experts that Russia will cancel or postpone the upcoming presidential election. He assured the German journalists that the elections will take place next year as the Russian Constitution requires. “I am a lawyer by profession and, I hope, not a bad one. So far as I remember our Constitution, there is no other option, besides choosing a new Russian president next year,” said Medvedev. The journalists asked Medvedev to comment on the opinion popular among experts, that he is the ‘leader of the liberal camp in the Kremlin,’ while First Vice-Minister Sergei Ivanov is the ‘leader of the siloviki and security forces’. Medvedev spoke out against such an over-simplified understanding of how political power is distributed in Russia. In his words, political life is “always easier to portray, if one divides it into two camps.” “But the real world is many-sided. And with regards to Sergei Ivanov and me, we have very similar views. We stand for a market economy, private property, and democracy,” explained Medvedev. In their conversation with Medvedev, the journalists touched on many tricky subjects. For example, a correspondent from Stern reminded Medvedev that the level of corruption in Russia’s bureaucracy is one of the highest in the world. “This has many causes. The moral and ideological values of the Soviet Union, which departed along with communism, were not simply replaced during the 90s with European values. I remember a visit from a German judge, while I was still studying law. One of my classmates asked him why there was not a statistic about how much German judges make in bribes. Our guest was discouraged. We have always had a high level of legal nihilism. It has not been understood how a government that acts illegally shows disdain for fundamental rules,” admitted Medvedev. According to Medvedev, “Those who receive or give bribes should be strictly punished, in order for them to understand that they committed a crime.” Therefore it is also necessary to have a discussion about changing the moral and legal culture in the Russian government. “Strong laws alone do not help. 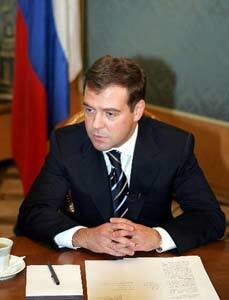 It is much more important that we raise the overall standard of living,” said Medvedev. He added, that in Russia “we must reach a level of stability, in order that nobody is scared of the future.” “Only then can we motivate people to consider it illegal to not pay taxes or take bribes.” He also reminded the journalists that in Russia’s social sphere important changes have begun to take place, and for the better. For example, the salaries of teachers, medical workers, and judicial employees have grown in recent years. The journalists from Stern, however, expressed doubts in the possibility of supporting economic stability for many years ahead so long as the Russian government, in their opinion, “relies too much on its fossil fuels and invests too little in infrastructure.” “Believe me, the development of infrastructure is very important to us. If we only relied on our [natural] resources, it would result in a dead end street. I manage the national projects, which relate to the development of these spheres, such as health care, education, housing, and agriculture. We want to create decent living conditions not only in the big cities, but also in rural communities,” argued Medvedev. He also said that the most urgent problem that needs to be solved in the national projects is the correction of the catastrophic demographic situation. “People at one time stopped believing in the future, and therefore did not want to make a family. We intend to encourage our citizens to raise children. We help parents to pay for childbirth – with the help of the ‘maternity capital’: 250,000 rubles, which each mother will receive for each child she has after her first. But this money may only be used for improving living essentials, education, or retirement savings. Our goal is to stabilize the population level by 2025 at 145 – 150 million people,” explained Medvedev. The conversation also touched on the price politics of Gazprom, of which Medvedev is Chairman of the Board of Directors. The journalists asked, “Can you understand why this giant company scares so many in Europe, mainly because it is in the hands of the government?” In response, Medvedev claimed that “for businesses that control key strategic resources on which so many people depend, government participation is unavoidable.” Gazprom possesses the largest reserves of natural gas in the world. When I started on the Board of Directors, the company was worth eight million dollars, and today it is more than 250 million dollars. Someday, it could become the richest corporation in the world. The whole country depends on Gazprom. We do not want the risk of economic and political collapse, which could result from selling the business to ten private owners,” explained Medvedev. Medvedev assured that on the international market the gas company is guided by only economic, and not political, interests. He said, that “in the CIS not all are ready for market prices” and “the wave of fear” from these countries “rolled all the way to Western Europe.” In retrospect, according to Medvedev, a conclusion could have been found that did not result in rising gas prices and injured economies for any of those countries. Medvedev claims that now those governments will not waste gas “and that will positively affect the economy and environment.” He also assured all foreign economic partners that in the future Gazprom will always fulfill its supply obligations. Answering the criticisms of the German journalists about how the Russian government applies pressure on the media, for example on NTV, Medvedev said that the “channel can interview whomever it pleases,” including representatives of the opposition. In his opinion, however, “the mass media should focus its coverage on real political players.” “Furthermore, anyone can find information on many marginal political groups over the internet,” added Medvedev. This entry was posted in elections, Gazprom, media, Medvedev, translation. Bookmark the permalink. Hey, check these young Dimitry Medvedev photos. Really interesting.